This thread shows how to do a basic spectral fit with the appropriate response files. If you are interested in including the background in the fit as well, see the Simultaneously Fitting Source and Background Spectra thread. Please follow the "Obtaining data used in Sherpa threads" thread. The instrument response for a data set is established when the appropriate response files (ARF, RMF) are loaded into the Sherpa session. If the instrument response files are written in the header of the PHA file, Sherpa will load them automatically; if not, as in this example, they need to be loaded manually with the load_arf and load_rmf commands. This output shows that rmf.fits and arf.fits currently define the instrument response. Figure 1 shows the resulting plot. Notice that the plot now includes only the data in the specified energy region. We will fit the spectral data using a source model expression that involves multiple model components. The first of these model components is the one-dimensional power-law model 'powlaw1d'. 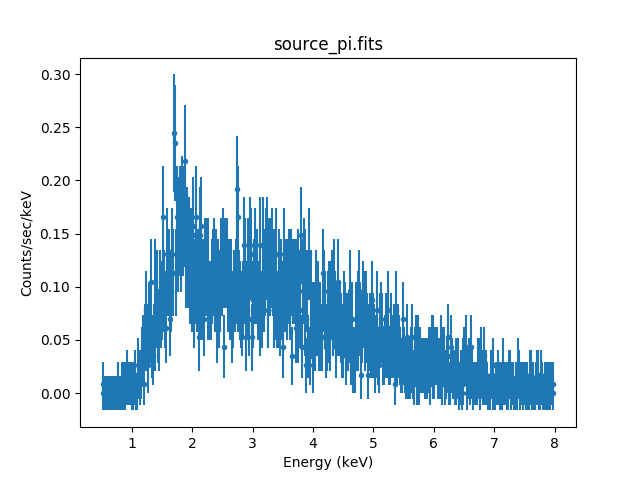 The second of the model components is an XSpec photoelectric absorption model called 'xsphabs' in Sherpa. Please see the XSpec User's Guide for more information about this model. Note that all XSpec models are available from within Sherpa and their XSpec names are preceded by xs. The guess function may be used to estimate initial parameter values for a model, as well as the minima and maxima for their ranges; where guess() is not able to estimate initial parameter values, we set our own. To have Sherpa automatically query for the initial parameter values when a model is established, set 'paramprompt(True)' (it is 'False' by default). 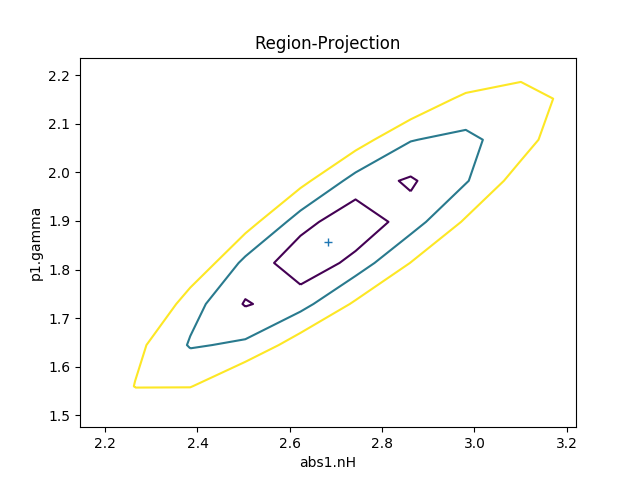 This output shows that abs * p1 is currently defined as the source model expression. By default, integration over an energy bin is turned on for both the abs1 and p1 model components; a change to the integration flag will not change the fit. 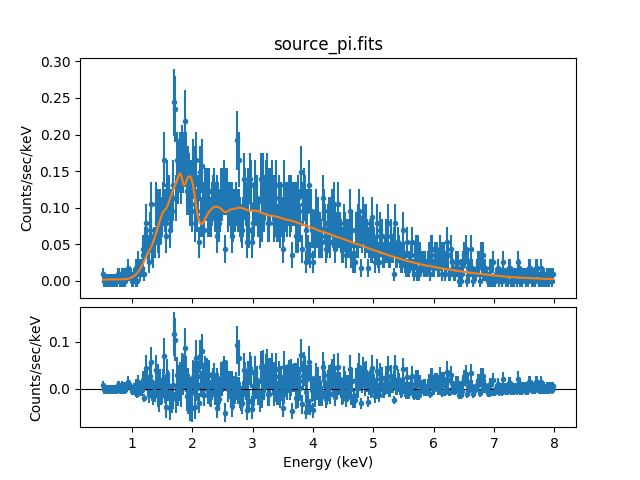 Since we are using a multiplicative source model expression to fit binned PHA data, integration of the source expression over each energy bin will be performed during fitting. As of the release of Sherpa v2 in CIAO 4.2, we may choose to explicitly set the complete convolved model expression to be used for fitting a source data set, using the new function set_full_model, together with get_response or get_arf/get_rmf (an associated background spectrum may be fit simultaneously using set_bkg_full_model; see the threads Simultaneously Fitting Source and Background Spectra and Fitting a PHA Data Set with Multiple Responses for examples). The set_full_model function offers an alternative to using set_source, which automatically convolves the appropriate instrument response with the defined source model expression—but which does not allow for applying separate responses to individual model components within a single model expression, e.g., to leave some model components unconvolved by the instrument response. The following set of commands represents the manual definition of the chosen source model, which was automatically (and equivalently) defined above with set_source. The get_response function returns the ARF×RMF instrument response model which can be used to explicitly convolve the source model. Multiplication by the source exposure time is done implicitly. Chi2XspecVar is the XSpec version of the χ2 fit statistic with data variance. See the section Examining Fit Results for a list of Sherpa functions which provide detailed information on the quality of parameter values used in a fit. Figure 2 shows the resulting plot. The features seen in the residuals could be due to the real source emission being different than the assumed power-law model, or a result of calibration uncertainties. We do not discuss further scientific analysis here, which would involve changing the source expression to include a preferable plasma emission model and refitting. In CIAO 3.4, the GOODNESS command was used to get the χ2 goodness-of-fit. This information is now reported with the best-fit values after a fit, as well as with the post-CIAO 4.3 equivalent to the 3.4 GOODNESS command, calc_stat_info and get_stat_info. These functions, along with the show_fit and get_fit_results commands, allow access to this information after the fit has been performed. The save function records all the information about the current session to the binary file session1.save, and the save_all function records the session settings to an editable ASCII file. One may verify that the session has been properly restored by comparing the show_all() output from the Checking Sherpa Session Status section. 13 Jul 2010 updated for CIAO 4.2 Sherpa v2: set_full_model is available for explicitly defining complex model expressions. S-Lang version of thread removedremoval of S-Lang version of thread. 29 Jun 2011 title of a referenced thread was changed from "Independent Background Responses" to "Simultaneously Fitting Source and Background Spectra"
07 Nov 2016 updated for CIAO 4.9, no content change; notes moved to admonition blocks.